Read Hunger and be part of Tacoma Reads 2017. Get your copy at any Tacoma Library branch and join the discussion! Hunger is Roxane Gay's powerful memoir discussing the effects of trauma on self-image and weight, and exploring the author’s experience interacting with societal expectations around a woman’s appearance. The title is Mayor Marilyn Strickland’s selection for Tacoma Reads 2017, the city's community wide reading program, now in its 15th year. Copies of Hunger are currently available at all Tacoma library locations and local bookstores. 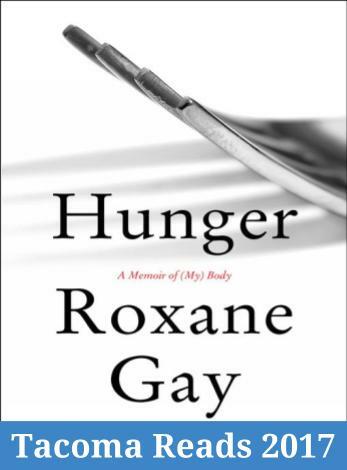 “I chose ‘Hunger’ for Tacoma Reads 2017 because Roxane Gay’s brutally honest memoir explores issues that make us uncomfortable and are worthy of discussion such as body image, our relationship with food, assault, pain and our sense of basic human decency," said Strickland. “Gay is a New York Times bestselling author and we look forward to hosting her for a book talk."